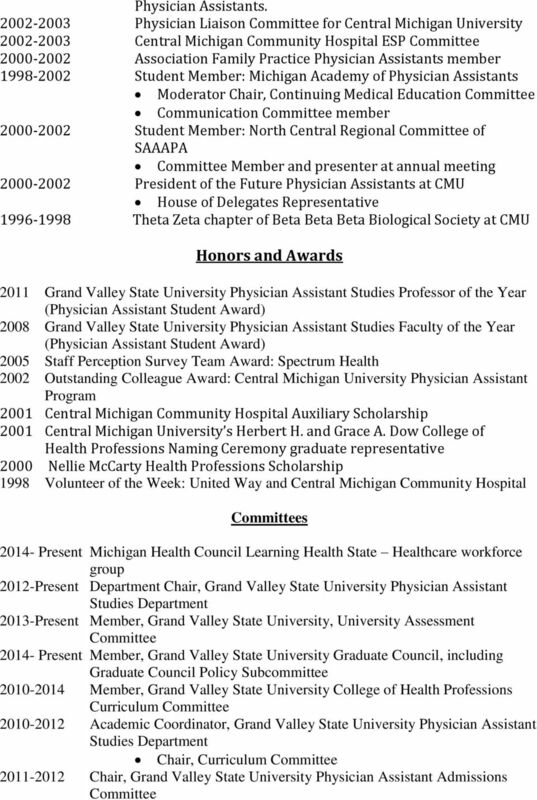 Download "Andrew D. Booth, MS, PA-C"
4 2010-Present Grand Valley State University Awards Committee 2010-Present Chair, Faculty Search Committee: Grand Valley State University Physician Assistant Studies Department Chaired 2 faculty searches (2008 and 2010) 2009-Present West Michigan Interprofessional Education Initiative Co-chair of Simulation workgroup Grand Valley State University Campus Life Committee Grand Valley State University Health Professions Undergraduate committee 2007-Present Grand Valley State University Simulation Advisory Committee 2008-present: Co-chair 2007-Present Program Evaluation and Review Committee: Grand Valley State University Physician Assistant Studies Program 2007-Present Admissions Committee: Grand Valley State University Physician Assistant Studies Program Membership committee: Michigan Academy of Physician Assistants Finance Committee: Michigan Academy of Physician Assistants : Chair Staff Perception Survey Team: Spectrum Health Distinguished Fellow Development Task Force: American Academy of Physician Assistants Academic Experience: Teaching areas Interprofessional Education Simulation Patient Evaluation: History and Physical Examination Clinical Procedures Physician Assistant Leadership History of the Physician Assistant Profession Lectures/Presentation Interprofessional Education: What s a Program to do? Physician Assistant Education Association Annual Education Forum. November 10, Seattle, WA. Oral Case Presentations. Michigan Academy of Physician Assistants Annual CME Conference. October 12 th, Mt. Pleasant, MI. 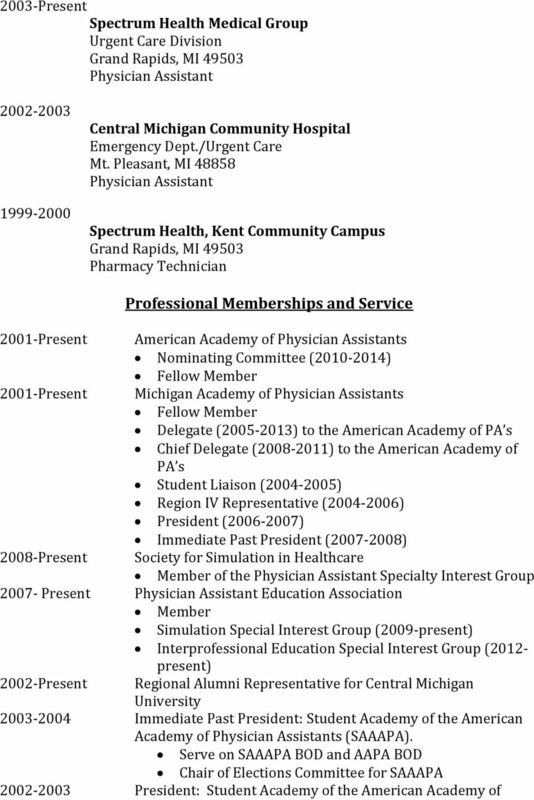 Exposure of GVSU Physician Assistant Students to Different Health Professions during the Didactic Phase Increases the Awareness of Students to Interprofessional Collaboration. West Michigan Interprofessional Education Conference, September 27, Grand Rapids, MI. 5 Key Elements of Debriefing an Interprofessional Simulation: The Who, the What, the How. West Michigan Interprofessional Education Conference. September 27, Grand Rapids, MI. Best Utilization of PAs and NPs. Holland Hospital, March 10 th, Holland, MI. 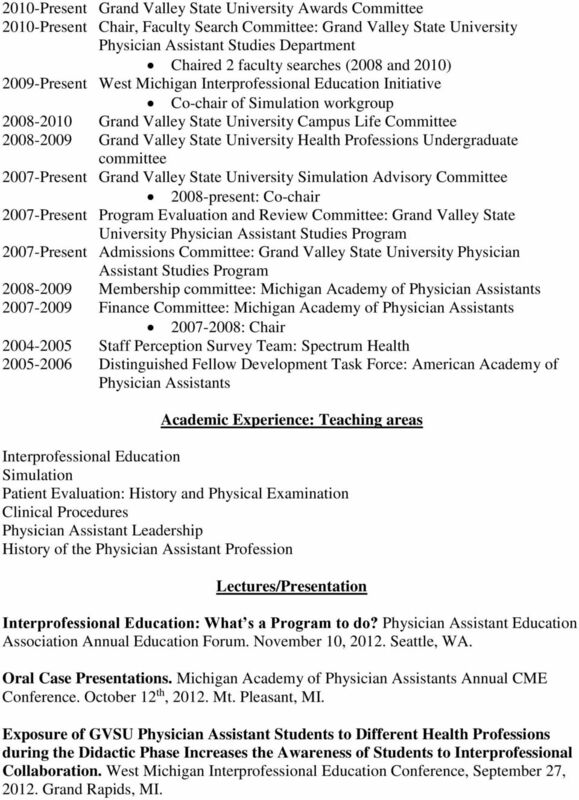 Physician Assistant Leadership. Michigan Academy of Physician Assistant Annual CME Conference. October, Traverse City, MI. 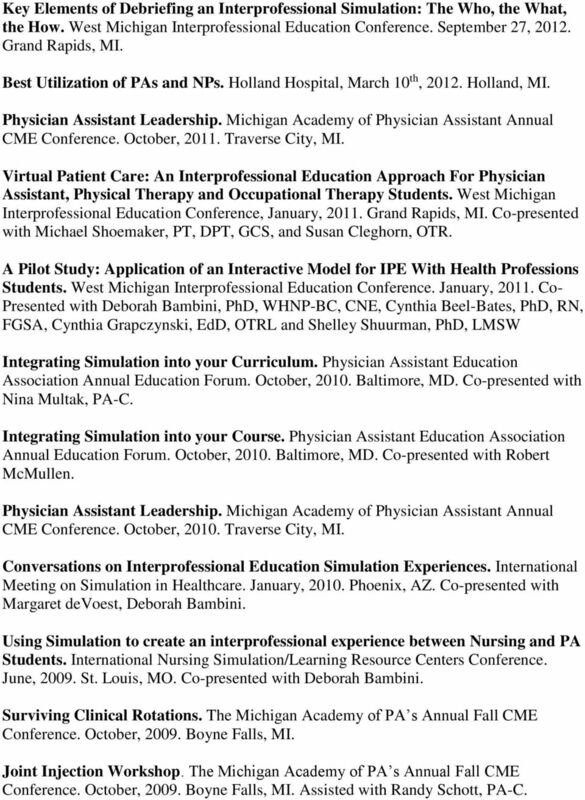 Virtual Patient Care: An Interprofessional Education Approach For Physician Assistant, Physical Therapy and Occupational Therapy Students. 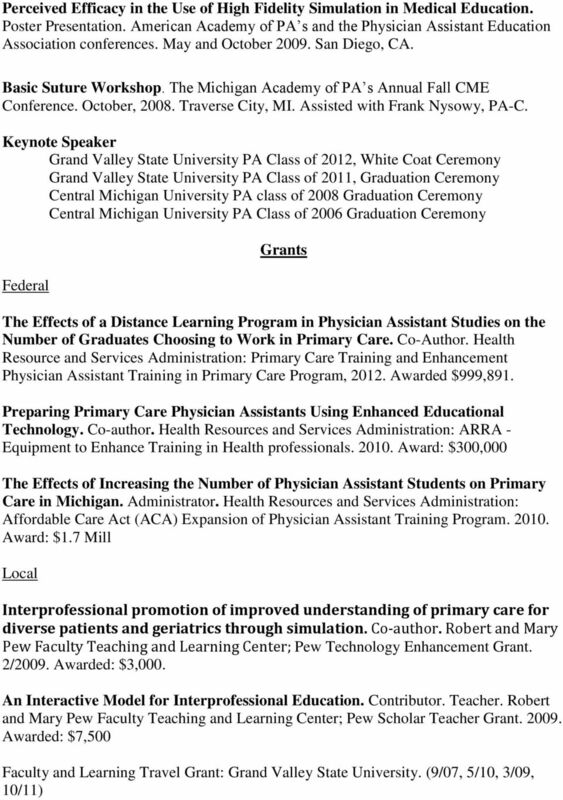 West Michigan Interprofessional Education Conference, January, Grand Rapids, MI. Co-presented with Michael Shoemaker, PT, DPT, GCS, and Susan Cleghorn, OTR. 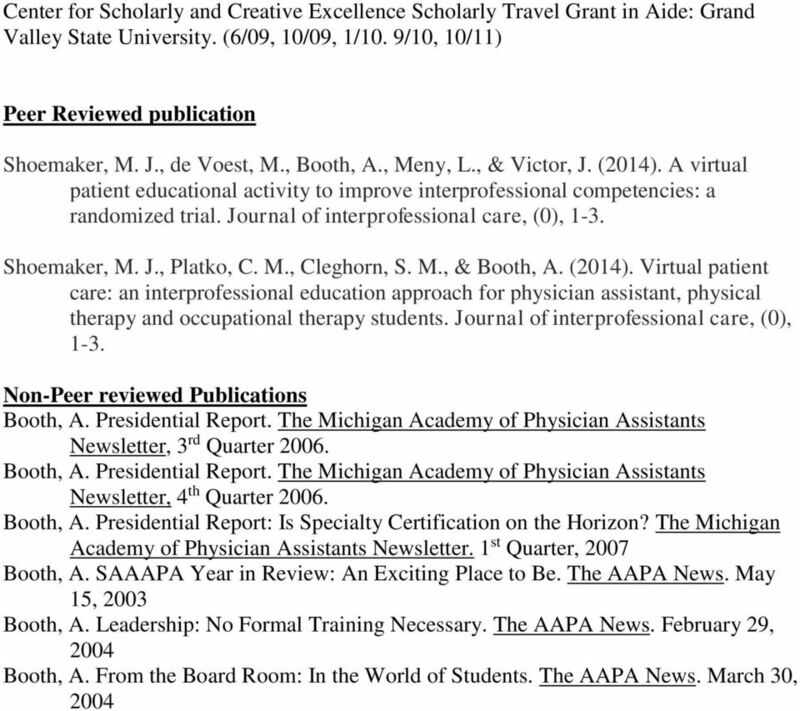 A Pilot Study: Application of an Interactive Model for IPE With Health Professions Students. West Michigan Interprofessional Education Conference. January, Co- Presented with Deborah Bambini, PhD, WHNP-BC, CNE, Cynthia Beel-Bates, PhD, RN, FGSA, Cynthia Grapczynski, EdD, OTRL and Shelley Shuurman, PhD, LMSW Integrating Simulation into your Curriculum. Physician Assistant Education Association Annual Education Forum. October, Baltimore, MD. Co-presented with Nina Multak, PA-C. Integrating Simulation into your Course. Physician Assistant Education Association Annual Education Forum. October, Baltimore, MD. Co-presented with Robert McMullen. Physician Assistant Leadership. Michigan Academy of Physician Assistant Annual CME Conference. October, Traverse City, MI. Conversations on Interprofessional Education Simulation Experiences. International Meeting on Simulation in Healthcare. January, Phoenix, AZ. Co-presented with Margaret devoest, Deborah Bambini. Using Simulation to create an interprofessional experience between Nursing and PA Students. International Nursing Simulation/Learning Resource Centers Conference. June, St. Louis, MO. Co-presented with Deborah Bambini. Surviving Clinical Rotations. The Michigan Academy of PA s Annual Fall CME Conference. October, Boyne Falls, MI. Joint Injection Workshop. The Michigan Academy of PA s Annual Fall CME Conference. October, Boyne Falls, MI. Assisted with Randy Schott, PA-C.
Daniel Thomas Thibodeau, MHP, PA-C, DFAAPA 651 Colley Ave. Lester Hall Room 328 Norfolk, VA 23507 757.446.7057 office thiboddt@evms. Angela Renae Mund College of Health Professions 151-B Rutledge Avenue, MSC 962 Charleston, SC 29425 mund@musc.edu. CAREER SYNOPSIS Marsha L. Lewis, PhD, RN Marsha Lewis, PhD, RN is the Dean of the UB School of Nursing (UB SON). 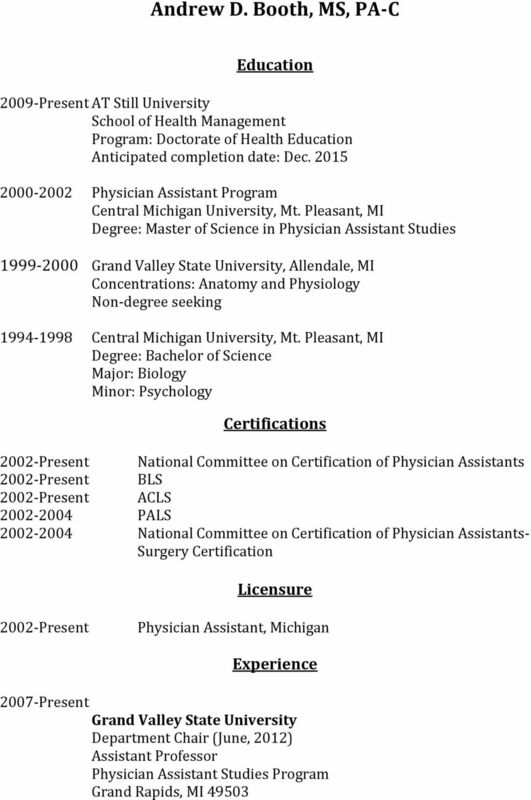 Dr. Lewis was recruited to the position in February 2012 following a national search. Dr.
Pietsch, T.M. (2012). A transition to e-mentoring: Factors that influence nurse engagement. CIN: Computers, Informatics, Nursing, (30)12, 632-639. Curriculum Vitae. 2009. Betty Irene Moore School of Nursing Postdoctoral Fellow. University of California, Davis. CURRICULUM VITAE. Linda G. Williams, MS, RN Associate Lecturer. 1990 University of Wyoming M. S. Nursing. 1981 University of Wyoming B. S.
CURRICULUM VITAE. Lisa C. Plymate, M.D. McGill University, Montreal, Quebec, Canada, B.Sc., Genetics, 1965-69. Curriculum Vitae. SARAH SHELLENBERGER, R.N., M.S.N., WOCN, CLNC 11006 W. Joan Dr. Odessa, TX 79764 432-770-3218 (cell) sarahsh@clearwire. CURRICULUM VITA. Sharon McDonald, Ph.D(c), R.N. 667 Old Highway 15 South Ellisville, MS 39437 (601) 422-7775 Sharon.McDonald@usm.